"You are cordially invited to Argentia, the galaxy’s most exclusive tax haven, to attend the funeral of mining magnate Carlo Mazzini. The memorial service will be followed by music, light refreshments, and murder! Can the Doctor, Nyssa, Tegan and Adric apprehend the murderer before Argentia – and everyone on board - is forever cut off from the rest of the Universe?" Back in the dim and distant country that was September 2014, I reviewed the play Mask of Tragedy for DWO and sung the praises of Samuel West’s turn as Aristophanes in it. He nailed the comedy perfectly, and the extras showed him to be genuinely passionate about Doctor Who and infectiously enthusiastic. 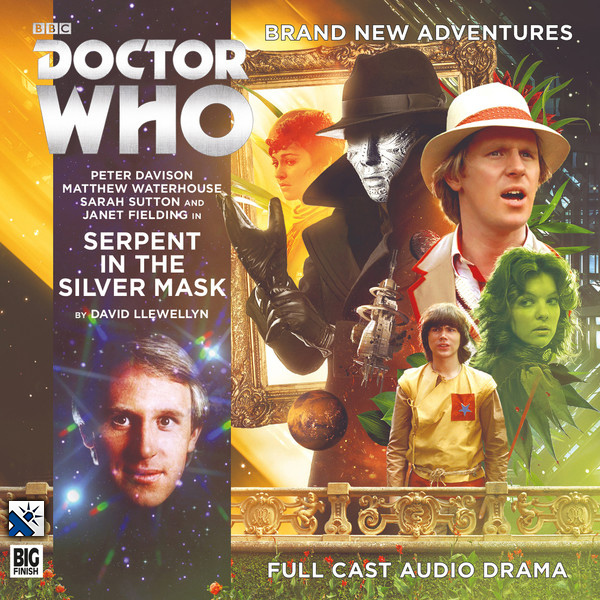 Flash forward to March 2018 (present day at the time of writing) and Big Finish have just released Serpent In The Silver Mask. Who is that actor putting in a genuinely excellent comic turn with multiple characters, all of whom have a degree of humour and gravity where required injected into them? Take another bow, Samuel West! In the extras for this play, director Barnaby Edwards rightly sings West’s praises and I think it’s worth just stressing again how good he is here. Truly, you’ll not find a better guest performance in a Big Finish play across the board; this equals the very best of them, perhaps even besting his turn in I Went To A Marvellous Party. What of Serpent In The Silver Mask elsewhere though? The play starts with our heroes landing on Argentia where the Doctor is on the hunt for the materials to build a new sonic screwdriver. Before too long, they’ve had their tongues swabbed and they’ve gatecrashed a funeral, but it appears that there’s a murderer on the loose... cue a Sherlock / Christie-style romp with robots and prisons and dolls, oh my! David Llewellyn is in the writing seat this time around and he’s clearly had the same memo as the other writers in this latest trilogy of Fifth Doctor / Adric / Nyssa / Tegan plays: listen to the DVD commentary for Earthshock and write them like that and not how the characters were on screen. It does mean you’re not going to come away from this play, or indeed any of the others in this trilogy, feeling you’ve experienced an ‘authentic’ era-accurate story. This sort of thing really bugs some fans and kills the mood for them, but for me personally it does not factor in at all when the scripts themselves are as strong as the past three have been. Are these the companions we used to watch on screen or the Fifth Doctor who saved the world in the early 1980s? Not even close at times but, crucially, does it matter at all? Mileage will vary. For my money though, I’d say Llewellyn has crafted an exemplary script with a central mystery that genuinely surprised me. I was so sure I had worked out “whodunnit” but, pleasingly, I was wrong. I had the means but not the right antagonist: and what better treat for a fan of the genre to be close but outfoxed? I think I had as much fun trying to work it all out as the Doctor does. Indeed, the Doctor is having a lot of fun here, whether conversing with a robot or playing detective, and it’s a joy. I’ve already celebrated West and the script, so it’s time again to heap praise on Edwards’s direction and the regulars’ performances. I want to highlight Janet Fielding here as this play gives Tegan a lot to do, but frankly Matthew Waterhouse is brilliant, Peter Davison hilarious, and Sarah Sutton making every scene count. This is an exciting time to be a fan of the Davison era. We had Jenny Colgan give us an incredibly good outing for Turlough in Gardens Of The Dead. Time In Office was my favourite main range release in 2017 by some distance, and this original trio of companions just goes from strength to strength in the main range. Does all this praise feel repetitive to you? It would be understandable if so as I’ve done that time and again this trilogy, because this trilogy is by a leap - a bound - and a mile, the very best succession of releases in the main range we, as fans, have had the pleasure to receive for years, now. Guy Adams’s stint as script editor for these plays has injected verve and spark in what was increasingly becoming a range of average releases, and his role in teasing out the best we’ve had for ages cannot be understated. Three high hitters worthy of full marks? Yes, I really think these plays deserve that accolade, and that gives me more pleasure to write and share online than I can readily articulate. As the Doctor herself put it: “Oh, brilliant!" + ORDER this title on Amazon.co.uk!